View and Download our Employment Application HERE! and some advice from some past ranch employees. Enjoy! So, What is a Dude Ranch? Today's dude ranch is both a place and an experience for families, couples, or singles to enjoy scenic beauty and a taste of the old west. The dude ranch is often the owner's residence, offering the genuine hospitality of home, and the amenities of modern living. You will find lots of unspoiled country in which to ride horses, hike, bike, swim, sightsee, and generally exhaust yourself. But the dude ranch also has lots of country where one can walk quietly and ponder. And, of course, a dude ranch has lots of hammocks where a cowboy and cowgirl can nap. The primary activity of the ranch, besides eating, is horseback riding. 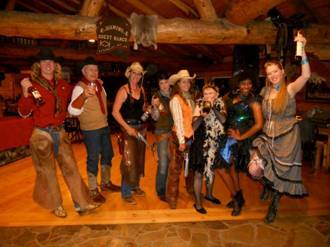 However all staff are responsible for ranch activities and guest entertainment. · Ranch life is informal, relaxed, and friendly, an opportunity to meet and enjoy others and make new friends. Home cooked meals are served family style, with guests and staff sharing the same table. The ranch also has frequent cookouts and other opportunities for folks to get to know each other without pressure. Ranch staff are truly interested in caring for the guests. They lead all activities, are available to help in any way, and enjoy being with their "city cousins." · Courtesy is a cowboy virtue. · You will be taught that your job is to provide your guests with the best vacation their family has ever had. · We offer stays of varying length from 3 days to several weeks. · A culture of the old west - guests are genuinely thought of as "friends of the ranch"
· Very high standards for the quality of service that guests receive. 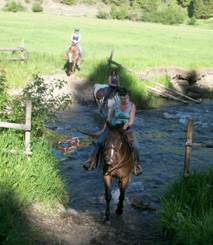 · According to a long-term ranch employee, a typical Dude Ranch Day might go something like this. Ask yourself after reading: Am I a good fit? · "We work long days and take breaks when we can. Most days most people take a few hours off in the afternoon. Some days we don’t do much of anything, and some days we never sit down. This is an issue that we discuss regularly, as it can be confusing to both live here and work here. We often have to counsel younger staff about drawing a line between their personal life and their work life." · "Off ranch activities are very limited, therefore staff members usually spend the evenings around the ranch visiting with the guests and other staff members. Is this work or free time? 7:00am - Wranglers are up and prepping the barn for the day’s rides. 7:15 am- In the kitchen for coffee and a bite to eat. Double check which guests are riding. 7:30 am- Round-up horses. Wranglers either help flag traffic, protect landscape or wait at the barn for the herd. 8:00am –While guests eat breakfast wranglers tack-up horses and prep for the days rides. 9:30am –Mount-up. Give safety orientation. 10:00am - Morning rides out! 12:00pm -Stop at pond for lunch or head back to lodge to eat. 1:00pm - Untack. Horses come first. Check if there is an afternoon ride. 2:00pm –Afternoon activities or afternoon ride. All staff is responsible for leading afternoon activities. 5:00pm - Wash up and help in the kitchen, or chat with guests (which ever needs doing). 7:00pm –Campfire. Be there with the s’more’s basket, an evening game, a tall tale or a guitar. Good time to make plans for tomorrow. 7:00am –Arrive in kitchen. Fill drink station. Make coffee and hot water. Tidy up dining area. 7:15am –Take out chicken bucket and milk bottles, wash last night’s dishes, tidy yard and start breakfast. 9:00am-2:00pm-Task list. Bake cookies, tidy lodge, clean public bathrooms, laundry, clean rooms, detail vehicles, rake petting zoo, vacuum lodge, etc. Check when ride left so you know when and where lunch is being served. 12:00pm-Lunch. Make sure truck and van are packed and ready for the lake at this time. 2:00pm –Afternoon Activities start. If all chores are done staff joins in and leads activities. 4:00pm –New guests arrive. Rooms need to be cleaned and ready at this time. 4:30pm- Get dressed for dinner. 5:00pm-Staff all back in lodge to start on dinner. Greet new guests. Start campfire. 6:00pm –Dinner. Eat with guests. 6:30pm-Start clean-up. Set out dessert. Wash dishes. Prep kitchen for breakfast. 7:00pm Campfire. Be there with the s’more’s basket, an evening game, a tall tale or a guitar. Good time to make plans for tomorrow. If working on a dude ranch doesn't appear to be a good fit, then you should pursue work in a different industry. 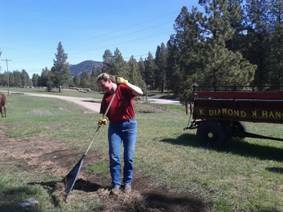 Dude ranch jobs have a set of benefits that are like no other jobs in the world! These jobs will give you an experience that is truly unique. · The Experience and Memories: The primary benefit of working on a dude ranch is the experience of working on a dude ranch, and collecting memories that may be the best memories of your life. These memories will be active, outside and fun! · Television, computers, computer emails, computer games, computer anything else, cell phones, instant messaging, or anything else in this nature?!? Payroll practices are as varied as the ranches. Do not expect to get rich working for a dude ranch. At the same time, because you have few expenses besides your toiletries, you can save a significant amount of money by the end of the season. Managerial positions, and professional positions such as chefs, may negotiate higher wages. Experience has taught the ranches that some very enthusiastic staff members may not get enough rest in this environments, and as early August rolls around, find themselves exhausted. We do not have a policy at all - guests may or may not tip individual staff. Some of these ranches divide the tip pool among the staff on a weekly, bi-weekly or monthly basis. Over the years we have found that a happy and efficient staff needs some guidelines to work together in a congenial atmosphere. By hiring staff who are comfortable within these guidelines, they have found that staff come together with common interests and goals in mind. It may sound a little "old fashioned", but besides working on the ranch, you will be living there too. The entire ranch is an extension of a home basically; therefore, staff are expected to share many common values and standards of moral conduct while at the ranch. 1. We treat each other, ourselves, our guests and our animals, with respect, dignity and high esteem. 2. We are employed because of our guests. We are here to provide them with the best personal service that we can. Every employee is responsible for making every guest happy and delighted. This means knowing the guests interests and including them in all activities. 3. Western attire should be worn at all times.This includes a nice cowboy hat, western button up, wild rag/bandana, clean rip free jeans and cowboy boots.We cater to families and your dress should be appropriate for this audience. Low-cut blouses, and saggy pants have no place at a family dude ranch. 4.We smile. We engage our guests with upbeat conversations. We use proper vocabulary with our guests. We don’t use our phones during meals. 5. We show up to work on time and ready to go. When you our late you make the other staff members take on extra work. Remember you work as part of a team. 6. Every ranch employee is responsible for the appearance of the lodge and the ranch. This includes cleaning up dishes, picking up trash, tidying up the lodge and yard. If you walk past the campfire and notice lariats left out from the last night’s events, we stop and quickly coil the lariats, and hang them up. If the ice water is low or out of ice fill ‘er up. Don’t wait for the next person to clean up what we can. 7. Each employee is responsible for creating a safe, secure and accident free environment for all guests and each other. 8. All employees protect what we have, including the ranch assets and animals. We conserve resources. We maintain ranch equipment so it doesn’t get broken. We treat equipment with care and make sure all animals are properly looked after and handled correctly. 9. “How can I help you?” is one of our favorite questions here at the ranch. So if you are standing around find another staff member or Kathy and ask them what they need help with today. At the ranch we never say ‘That’s not my job’. We help whenever asked. · "Noise" curfew on the ranch grounds is 10:00 pm. Many of you will live in the lodge or with Steve and June. Be respectful of others. · Absolutely no drinking and/or drugs on the ranch property. · Staff are expected be polite and courteous to ranch guests and each other at all times. · The staff will not be disruptive to guest activities. · Clean, neat appearance is expected at all times. NO BARE FEET, sandals, or clogs on the job. · Dating among staff members is discouraged. · Off ranch activities are very limited, therefore staff members usually spend the evenings around the ranch visiting with the guests and other staff members. · Inviting friends or family to the ranch must be cleared by the management first!! · Staff bedrooms are the only places on the ranch where staff can have privacy - absolutely no guests in staff bedrooms. Female staff shall stay out of male housing and male staff shall stay out of female housing. · Staff are responsible for the upkeep and cleanliness of their own bedrooms and bathrooms. We suggest that staff set up rotating bathroom cleaning schedules in order to share this responsibility equally. Staff bedrooms and bathrooms will be inspected regularly. If, in the sole opinion of the owners, unacceptable conditions persist, a maid service will be hired to clean, and will be paid by those staff receiving services, by payroll deduction. · Personal vehicles are encouraged. Ranch vehicles are only for working on the ranch. Guests are your customers, not your friends. 8. Minimal impact and no trace ethics. 9. When in the forest land and on horseback rides in the meadow-leave no evidence of having been there. 10. Respect ranch neighbor's rights and preferences. 11. Do not chase or harass in any way either wildlife or domestic stock. 13. Do not strike or throw stones at animals. 14. Do not allow horses unrestricted access to grain or hay. 15. Do not chase wildlife or cattle or poach wildlife. 16. Sexual harassment or intimidation shall not be tolerated in any form or manner. 17. Staff are welcome to bring their own horses. Only the owner of the horse may ride that horse. Guests and other employees are strictly prohibited from riding staff owned horses. “I had a wonderful experience in the ranch, the estate is huge, in the countryside, plenty of nature around, mountains, rivers, lake... is a real western place. Housekeeping Staff: Provides guests with a clean, inviting, and comfortable area for their accommodations while at the ranch. This includes guest rooms and shared spaces within the lodge.Ensures all porches/decks, public bathrooms, lobby, game areas, bar area, gift shop and guest rooms are presented to the highest level. The right person will thrive in a team environment, and have the capacity to complete tasks quickly and systematically without constant direct supervision. The ideal candidate will manage their time effectively, take pride in their work, have great customer service skills and be highly motivated. Staff will be required to stay approximately Mid-May through until mid-August. Must have a clean driver’slicense. No smoking, drugs allowed on property. Kitchen Staff: Will assist the cook with preparation, presentation, and timely delivery of all food served at the ranch.Ensures the kitchen including floors, fridges, shelves and counters are cleaned at ALL TIMES.Staff must have a warm, accommodating, professional manner and seeks to ensure the highest quality of guest satisfaction. Must be able to manage multiple tasks in a fast-paced dining environment while maintaining a positive attitude toward guests and working as a team player. Guest Services (Intern): Your main goal is to ensure a quality stay for all guests. You will assist with coordinating daily lodge activities, prepping for large events, answering phones, sending out welcome packets. 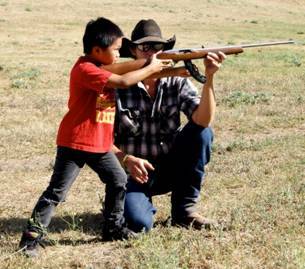 You will be required to lead a variety of ranch activities and entertain guests including children. 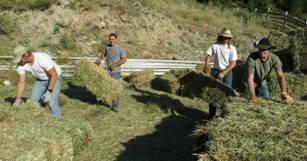 The position will also help with daily ranch activities including housekeeping and kitchen duties. The ideal candidate will work well in a team environment, be upbeat and positive, will be well organized and neat, and have excellent customer service skills. Join us for the Ultimate Ranch Experience. Seeking Authentic, Diligent, and Customer Service orientated people.